Our furbabies are important members of our families. Their love and affection is a treasured part of our lives. Our fur babies deserve the Anovite advantage. We know there is a direct correlation between health and the quality of nutrition. Most dog and cat foods offer minimal positive supplements to their diets. The primary ingredient consists of grains. The results, our pets suffer the effects of obesity and loss of energy. Our pet lines are designed to help your pets achieve a healthy boost to their immune system with added minerals, vitamins, and mineral supplements. Canine6 Formula contains 90 grams: Intended as a protein, vitamin and mineral supplement for puppies and adult dogs alike. High-quality protein, calcium, vitamins and minerals are often limited in commercial diets, but Canine6 Formula can fill the gaps. The colostrum proteins are rich in nutrients and immune factors that are designed to help puppies during the crucial weaning time and serve as an effective adult supplement. Feline6 Formula contains 44 grams: Intended as a protein, vitamin and mineral supplement for kittens and adult cats alike. High-quality protein, calcium, vitamins and minerals are often limited in commercial diets, but Feline6 Formula can fill the gaps. The colostrum proteins are rich in nutrients and immune factors that are designed to help kittens during the crucial weaning time and serve as an effective adult supplement. Canine6 Canine6 is a 90grams that is ready to serve, just sprinkle over food! There are no contraindications with any dosage amount of colostrum. Directions: 10-30 grams of bovine colostrum powder has been taken 1-4 times daily for 10-21 days. Feline6 is 44 grams ready to serve, just sprinkle over food and mix well! There are no contraindications with any dosage amount of colostrum. Directions: two (2) scoops per day (may be given at one time or throughout the day; scoop included in bottles). Canine6 and Feline6 helps to boost your pets immune system with our cornerstone product Colostrum6, which helps restore and provide the ideal immune support for dogs and cats. Our pet lines focus on helping your pets digestion with the introduction to healthy probiotics to their diet. As your pets age, their required nutritional intake fluctuates. The older they get, the slower their metabolism becomes. 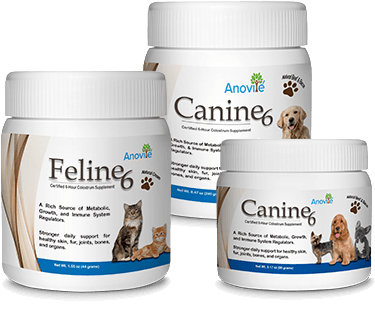 Canine6 and Feline6 provide the nutrition they need to maintain a healthy weight and their energy levels. The importance of providing your pets the appropriate minerals and vitamins. Natural pet products containing probiotics, glutamine, digestive enzymes and other nutrients can help to heal the intestinal lining and prevent some negative symptoms from reoccurring in dogs and cats.